This morning, around the same time that the Governor of Táchira enjoyed an easygoing chat from an air-conditioned Caracas radio booth about how not a single gocho has died during protests on his watch, Jimmy Vargas, 34, was on his way to his charcutería job, as usual. Finding the mall where he worked besieged by the National Guard, he sought shelter from the tear gas and rubber pellets that the soldiers were firing indiscriminately into the second floor of the building. One mis-timed peek out to see what was happening cost him his life. According to eye-witnesses, he fell to his death from the second story balcony after being hit in the face with rubber buckshot (perdigones) and a tear gas canister and losing consciousness. (see the update below — the story is a little confusing). Neighbors manning the nearest barricade came to his rescue and organized for a doctor to come see him (no surgeons were available at the hospital). Teamwork between piqueteros has become the norm in a town that has been all but abandoned to its own devices. Public transport unions have gone on strike due to lack of safety on the streets, and municipal police is powerless to stop National Guards brought in from other states. Wounded victims refuse to go to hospitals, since so many have been detained by authorities upon showing up on stretchers. Journalists have been repeatedly threatened, and also seek protection among town-dwellers who act as anonymous informants. Networks of intelligence and bonds of trust are what protect San Cristobal residents these days. Orphaned by a state at war with its own people, folks rely on an unspoken system of cooperation and solidarity between people who’ve known each other their whole lives, or perfect strangers who are all in this together. By Governor Vielma Mora’s own admission, even he has lost control over the “excesses” perpetrated by the security forces. In reality, of course, they don’t report to him – the people calling the shots are safely ensconced back in Fuerte Tiuna, in Caracas. Nobody even consults the governor. “It was 5:00 a.m. when the screams of women and the gunshots woke me up,” says the young store-owner from San Cristóbal’s middle class Las Acacias neighborhood. This is not normal. “Normal” is having the national guard show up to shoot pellets left, right and center at 11 p.m., not at this hour. Her community of mostly older residents is home to one of the most resilient barricades in town. Although their community has been playing this sysyphian game of build-the-barricade-and-wait-for-guards-to-come-tear-it-down for several weeks now, this morning’s particularly cruel and decidedly more intense GNB attack proved womanhood is no protection. All day people in the urbanizaciones have been confined to their homes while National Guards spray tear gas, rubber bullets and high caliber gunshots through the residential streets. The sound of shop alarms going off for hours on end, with no one coming to shut them off, is the unofficial soundtrack of San Cristóbal these days. One morning’s harvest from the streets of Las Acacias. Meanwhile, the stories circulate—somewhere between the status of rumor and urban legend, and stoked by the rampant uncertainty created by the media blackout, and the blocking of Zello, a smartphone app used by protesters to stay in touch. You hear about the family that was having a quiet sancocho at home when the National Guard burst in, roughed them up and stole their mobile phones. You hear of local protestors using homemade weapons, Molotov cocktails and crude mortars, against the security forces. You hear that local malandros – thugs – are having a field day amid the chaos, looting pharmacies and grocery stores with nobody around to stop them. 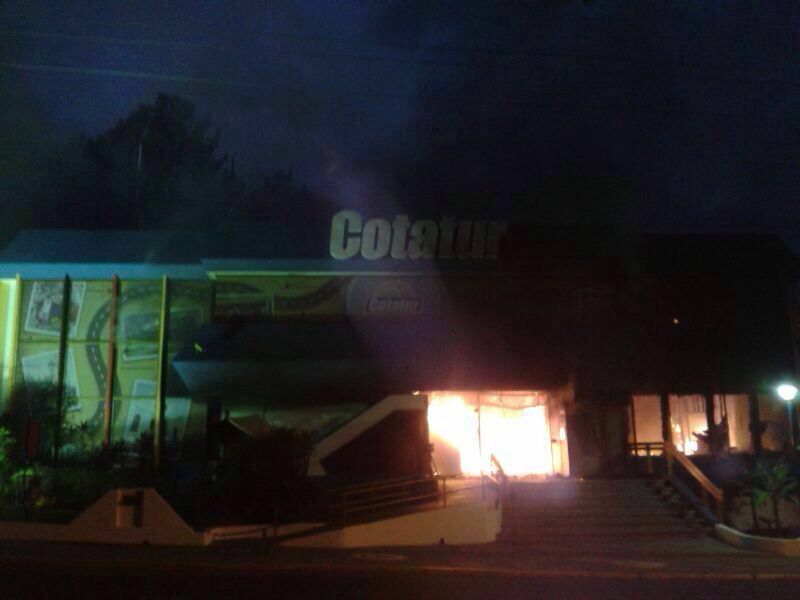 You hear that Conatur’s downtown headquarters are on fire. It all adds up to an atmosphere of total lawlessness and anarchy. “Far west stuff,” as one gocho we talked to put it. This is the story of the ongoing confrontation between the National Guard and the locals. The guards break windows of homes that bang pots and pans, and hurl tear gas canisters inside. They break into homes and fire rubber bullets in the air, just to terrorize and intimidate. 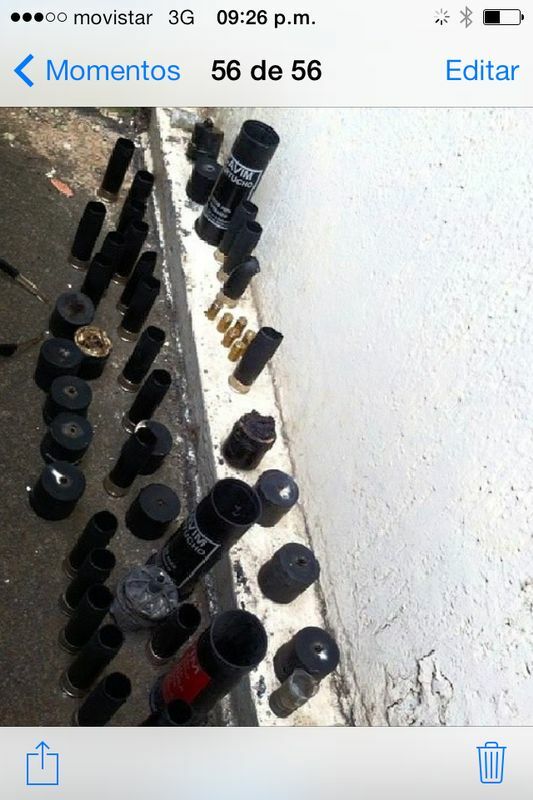 In another area of town, the barrio of Barrancas, one guarimba in particular has been compromised. It’s no longer students who mind the makeshift blockade, but third parties who saw financial potential in charging passage fees to passersby. So this former bastion of resistance has now been twisted into another form of corruption for clever opportunists. Armed men in motorcycles circle this barricade, and blend into the violence, taking advantage of chaos to go about their usual crimes with even less fear of punishment than usual. It adds a whole other layer of concern for neighbors, who get hammered twice, first by the National Guard, then by the choros who run the guarimba. Yet it is not fear of colectivos or GNB that keeps businesses closed “If I have to stay closed for three months, and that means that some change will come of this, then I will do it gladly,” says a young business owner, adding she has not opened hers in 10 days. UPDATE: This CNN video suggests that Jimmy Vargas slipped from the roof of the building and was not, in fact, hit by GNB fired rubber pellets. However, eyewitness accounts, national and international news reports, and the testimony of Jimmy’s own family, present the cause of death to be the GNB attack. The evidence is inconclusive either way, we will look into this as it develops.